Zoomer’s Choice Volume 1: Great Voices and Vocal Hits. Zoomer’s Choice Volume 2: Perfect Dining Music. 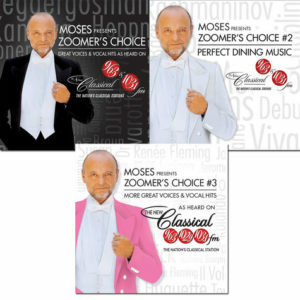 Moses Presents: Zoomer’s Choice Volume 3: More Great Voices & Vocal Hits. And by popular demand, we’ve also re-released “Zoomer’s Choice Volume 1: Great Voices and Vocal Hits” and “Zoomer’s Choice Volume 2: Perfect Dining Music” so you can collect the entire Zoomer’s Choice set for a special low price.